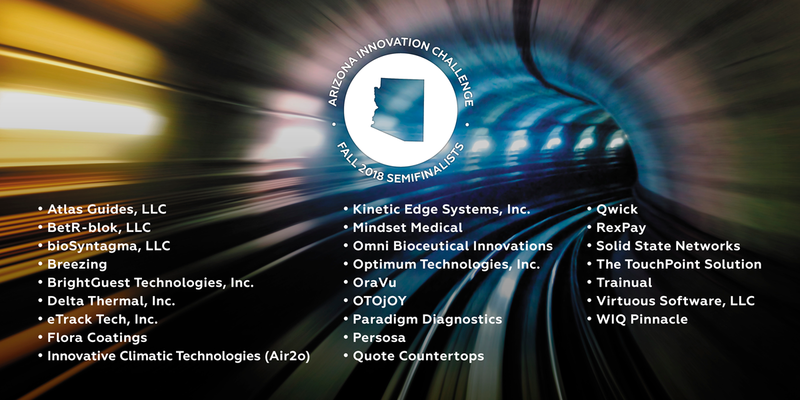 PHOENIX, AZ (October 29, 2018) – The Arizona Commerce Authority (ACA) today announced 25 semifinalists in the Fall 2018 round of the Arizona Innovation Challenge, a bi-annual business plan competition for promising early-stage companies in high-growth industries. The Arizona Commerce Authority (ACA) is the state’s leading economic development organization with a streamlined mission to grow and strengthen Arizona’s economy. The ACA uses a three-pronged approach to advance the overall economy: recruit, grow, create – recruit out-of-state companies to expand their operations in Arizona; work with existing companies to grow their business in Arizona and beyond; and partner with entrepreneurs and companies large and small to create new jobs and businesses in targeted industries. Visit azcommerce.com for more information and follow the ACA on Twitter at @azcommerce.